Watched more DVDs (I wanna complete the serial)…Library with Mummy to return library books at CompassPoint… Borrowed more books… Ooh… And hogged 24PACKETS (1 Litre) of Dutchlady UHT milk home!! Cold Storage selling them off at $1.90, BUY ONE GET ONE FREE!!! Hahaha.. How can a milk boi like me resist?!! But to think of it… The offer is only coz they need to buy back consumers’ trust after the melamine scare… Hmmmm… Not that I care! They are simply delicious!!! Just that my arms almost broke when I carried them all the way home… Really in need of some serious calcium! Wahhahahaha…. 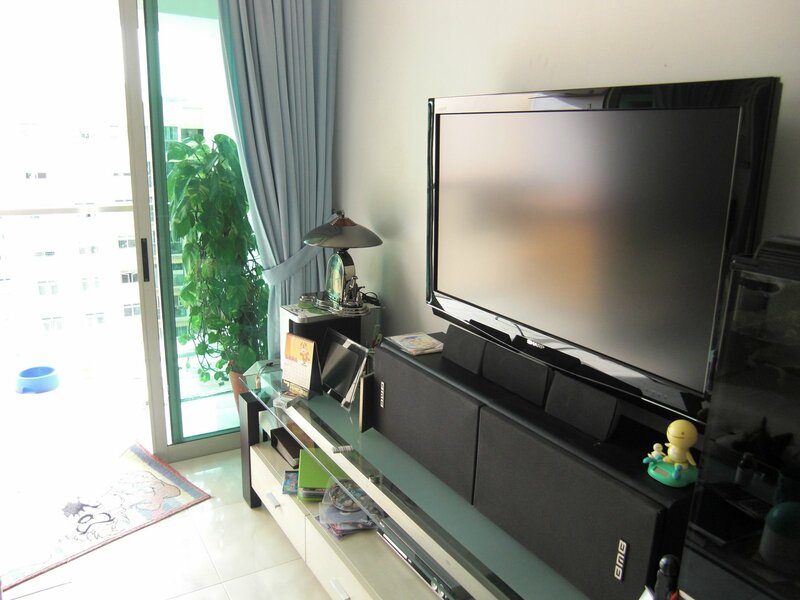 Oh, and below is a picture of the new LCD TV I bought for my parents… Looks nice in the living room hor! I finally finished the WHOLE 20 Episode serial!! Heee… Nice show… But the ending abit the not up to my expectation… Oh WellZ.. 20hrs of my life slipped me by… Went Tamp Giant with mum at night for another round of groccery shopping! Need to prepare my ingredients for creep picnic the next day… Went to peek at the price of the Dutchlady milk there: $1.90 each. NO one for one!! Yippy!!!!! The slog from Cold Storage was worth it! Hahahahaha…. 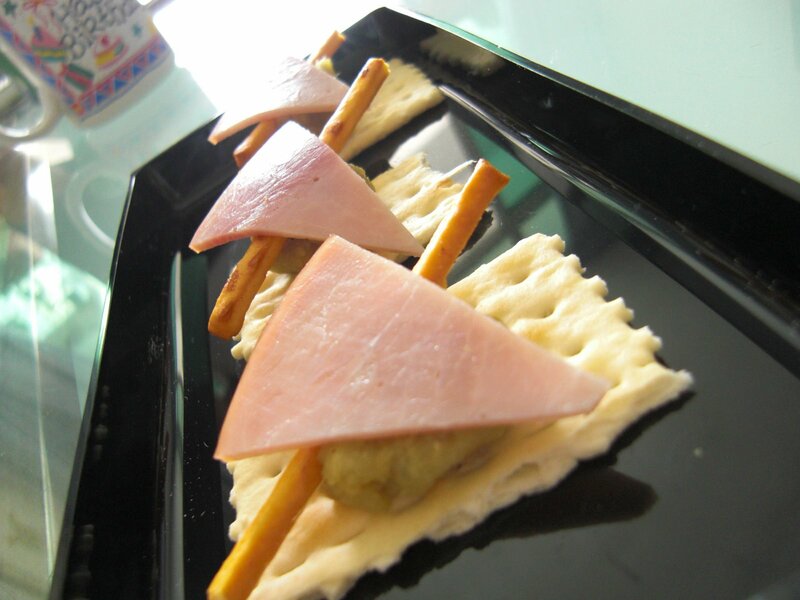 I intend the picnic to be a 3 course one, so I made “Italian fused Japanese Sweet Potatoe Mousse Canape” for appetiser! It looks great! Check it out! And ending the meal with light Japanese cheesecake coz I reckon we will be too full after the enormous okonomiyaki..
….Lim Chu Kang Cemetery….. Thank goodness that Alex offered to pick us up and join us on our cemetery tour on his Tuscon… I was seriously a *hi*ken over there…. Aargh.. Hate to admit it, but I was scared… I was the one who wanted a really creepy one, but one I reached there, the atmosphere totally overwhelmed me… I felt sooooo much like a intruder! It wasn’t my first time there in the afterdark hours, but never JUST 3 person!! Then comes the muslim cemetry… LAGI scary!! Luckily no one really wanna get down the car anyway… Phew…. We ended our night at the CREEPIEST ground of all…. The Chinese Cemetery… And the “FRESH” ones that is… OMG!!!!!!!!!!! *Rolled Eyes* They were still talking about how can we see the dunno what “whisp” thing… (According to BOTH of them, when the body starts to decompose, a gas will be produced. When the gas escapes outta the soil and interacts with the atmosphere, we can literally SEE small blue glowing gas balls!!!!!! Ahhhhh…. I feel like FAINTING!!!! Yes, I wanna go to cemetery to experience the peace and quiet and maybe a bit of eerieness… But NOT SEE anything!!! Gosh… What if we BREATH in any of those gas?!!!! Anyone who knows me would know how terrified of “dead” stuff… I am even afraid of the pets that died in my house (ok, except small fishes and insects)… Let alone dead HUMAN!! Gasp!